Ian John Hornak (Philadelphia, Pennsylvania, 1944 - Southampton, New York, 2002) American Photorealist painter (hyper-realistic). He was considered a romantic descriptive painter who added notorious surreal overtones to his works. "Not since the Hudson River School glorified the grandiose panorama of the natural world in meticulous detail has an American artist embraced landscape painting with the artistic totality of Ian Hornak." 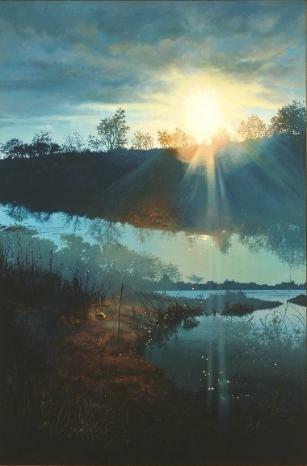 - Marcia Corbino, "Hornak Exhibit: Landscapes At Their Best," Sarasota Herald Tribune, March 7, 1980. Home of the South Wind, 1979, Galleries Maurice Sternberg. Smithsonian Institution: Archives of American Art, Washington D.C.
Washington County Museum of Fine Arts, Hagerstown, Maryland. Displaying artworks for Ian John Hornak.